Well, that was short lived, now wasn't it? The Fighting Illini football team, needing to win out in order to attain bowl eligibility, couldn't get past the Northwestern Wildcats last Saturday at Memorial Stadium, falling 21-16. As a result, the Illini will be staying home for the holidays once again, and can do no better than match their 5-7 record a year ago. That task seems even monumental, since the Illini's next opponent is the Cincinnati Bearcats, who are in the thick of the BCS chase and are undefeated at 10-0. That in itself will be a tall order, but added to the fact that is at Nippert Stadium in Cincinnati, and the situation becomes that much tougher. To look back, if we must, to the Northwestern game, once again, it was a winnable game. Juice Williams sat this one out with an injury, so redshirt freshman Jacob Charest got the start. He didn't fare that badly, moving the Illini down the field. It certainly wasn't his fault that Matt Eller missed a chip shot field goal. It's been that kind of a year for Ron Zook and the Illini, and the two game winning streak just sparked Illini Nation's hopes for what was to come. Thanks to some quality scheduling by the athletic director, the Illini once again have another bye week and are done with Big Ten play for the year. The only two games left on the schedule are the aforementioned Cincinnati game, and the final home contest, December 5th against Fresno State. Since there won't be anything to play for in that game, word on the street has it that tickets could be very cheap for that one. So, if you have ever wanted to attend an Illini football game, but were driven away because of the high prices of tickets, then this game could be for you! Stub Hub is advertising tickets for a low as 99 cents, which is a deal in anybody's world. Just goes to show you how far this program has fallen. The freshman class for Bruce Weber has been a much talked about group, and if the first two games of the regular season are any indication, then this is going to be quite a season. After getting by SIU Edwardsville 96-69 in the opener last week, the Illini returned to action on Tuesday evening against Northern Illinois, and came away with a 80-61 victory. Brandon Paul, or BP3 for short (pictured at right), has been the talk of the season thus far, setting a record for a freshman making his debut in scoring with 22 against SIUe, then following it up with 20 against the Huskies. Paul scored all of those 20 points in the first half, then decided to work on his defensive tactics in the second half and went scoreless. One thing has been evident about this freshman class: these guys can play. Paul can shoot the ball as well as anybody, and D. J. Richardson is getting good command of the floor and also can shoot the ball pretty well. Tyler Griffey, who has impressed early on, reminds me of a shorter version of Jack Ingram. Griffey can shoot from the outside, and is beginning to work inside as well. The fourth member of the class, Joseph Bertrand, is battling an injury and his status for this season is still up in the air. Since you have a while to declare a medical redshirt, I think that is what the staff is waiting on at this point. With the Illini sitting at 2-0 on the season, the next stop on the road is the Las Vegas Invitational, with the first two games of the tourney starting out at the Assembly Hall. The Illini's first opponent will be the Presbyterian Blue Hose (7:00 pm, Saturday 11/21 Big Ten Network). So, what exactly is a Blue Hose? The Presbyterian College website defines a Blue Hose as "fierce Scottish warrior. If you have ever seen the movie Braveheart, then you have seen a true Blue Hose." That's not what I had pictured at all (see right). And no, it's not what a female smurf wears when she goes out for a night on the town. Anyway, Presbyterian College comes to Champaign this weekend in their first season making the transition from Division II to the top level in college athletics. Typically, the results aren't pretty for teams making this jump for the first couple of years, but they eventually become what are known as "mid-majors" and dangerous teams in the NCAA Tournament. They even get featured on ESPN in early February when the "Bracket Busters" matchups are played out. The women's basketball team is out to a fast 2-1 start, and are putting points up on the board at a pace not seen by the females at Illinois in quite some time. After a season opening overtime loss to Temple in Philadelphia, the Illini have won the last 2 games over Siena (85-53) and Central Michigan (77-59). Jenna Smith and Lacey Simpson continue to lead the Illini as seniors normally do, but Coach Jolette Law has a talented bunch of freshmen herself that can play with the best of them. Adrienne Godbold, Karisma Penn, Brianna Jones, and Kersten Magrum give Law depth, something that she has not had since becoming the coach at Illinois. However, the good news comes with some not-so-good news as well. Amber Moore, one of the talented freshmen, is gone for the year with an ACL injury sustained in the opener against Temple, and Destiny Williams, perhaps the jewel of the recruiting class, has taken a indefinite leave of absence from the team, according to a statement given by Law before the game with Central Michigan. Under Law's predecessor, Theresa Grentz, this type of behavior was the norm rather than the exception, but any way you look at this situation with Williams, it doesn't appear to be good. Who knows when, or if she will ever play for the Illini again. We do know one thing, it won't be soon. The Illini get back into action on Sunday afternoon when they host Bradley at the Assembly Hall. Finally, the Illini women's volleyball team survived their tough road trip last weekend, and as expected, saw their 11 match win streak snapped at the hands of Penn State. When you go up against the Nittany Lions, your best needs to be given for every single play. The Illini were defeated in 3 games by scores of 20-25, 25-27, and 15-25, and can take away that at least they took Penn State to overtime in the second game. The Illini righted the ship on Sunday by dispatching Ohio State in 4 games (25-17, 25-8,18-25,25-21) to move to 21-4 overall and 13-3 in Big Ten play. The Illini conclude the home portion of the regular season this coming weekend at Huff Hall when they welcome Iowa and Wisconsin. Both matches begin at 7:00 pm on Friday and Saturday. 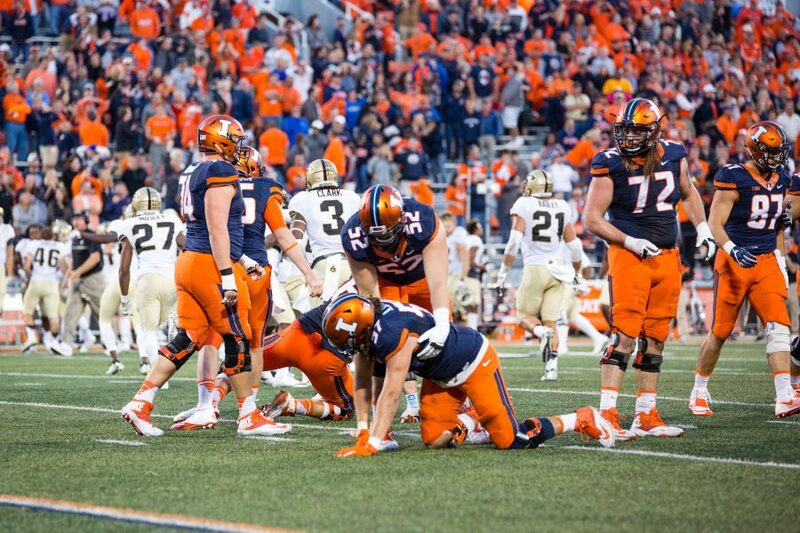 Don't look now, but the Fighting Illini football team is on a bit of a winning streak. The latest triumph occurred last Saturday in Minneapolis at the Gophers' new, state-of-the-art stadium. This is an outdoor venue that is replacing the Metrodome, and according to those that were there, it is quite different to be playing football outdoors in Minnesota in November. Granted, it was a nice day, which could have led to the peculiar feeling. Jacob Charest was pressed into service for Juice Williams, who sustained an ankle injury in the first quarter and did not return to the game. Charest did admirably in his first substantial action as an Illini, completing 10 of 19 passes for 185 yards and a touchdown pass to Arrelious "Regus" Benn. But hold on, Illini Nation. Before you get too antsy and start booking postseason plans, you need to keep a few things in mind. First of all, it takes 6 wins to become bowl eligible, and the Illini only have 3 at the moment. This sudden burst of success has been a welcome sight to most fans, and has taken the focus off of embattled coach Ron Zook, at least for the time being. What can be attributed to the performance of the team the last couple of weeks? Most point it to the second half of the Michigan game, and the chase-down tactics of freshman Terry Hawthorne. He turned the momentum of the game totally around with that one play, and things have been looking up ever since. The schedule also isn't indicative of rolling a 6. After this weekend's game at home against Northwestern (11:00 am, ESPN Classic), the Illini end the season with two non-conference games, at Cincinnati the day after Thanksgiving, and then entertain Fresno State on December 5th. The Cincinnati game looms large, especially given the fact that they are ranked #5 in the country and are still very much a factor in the national championship picture. But, as Zook has instructed his players many times, they are not looking ahead, rather focusing on one game at a time. The media can speculate and look ahead, which is why I am doing so at this point. But, back to the Wildcats for a minute. They come in to the game against the Illini at 6-4 overall and 3-3 in Big Ten play, and are currently bowl eligible. The Illini and Wildcats used to play for the Sweet Sioux Tomahawk, but in this politically correct world that we live in, has been retired and will now play for the Land of Lincoln trophy. Northwestern is riding high coming in to Champaign after upsetting Iowa, who was a top ten team and one of the few unbeatens still left in the FBS. Their situation is an unsettled one at the quarterback spot, as both starter Mike Kafka and Dan Persa have both battled injuries at one point or another this season. Kafka only threw for 72 yards in the upset win, and the Wildcats were paced by Persa as their top rusher, who had 67 yards. So, what does all of this mean? The Illini actually come into the game as a favorite, something that hasn't happened since the Illinois State game. How is that possible, you ask? I'm not the vegas oddsmakers, so I don't have a clue. My guess would be that since the Illini are at home, they are a slight favorite. But, as Zook says, you can throw everything out the window when it comes to these rivalry games. Most of the players know each other from their high school days, so it is more of a show for them to one-up each other. Still, it should be a pretty good game, and it sounds like the weather will once again be nice for November in Champaign. Bruce Weber's Illini basketball team begins the regular season on Friday evening when they host the Cougars of SIU-Edwardsville at the Assembly Hall. The Illini have looked about as expected in their two exhibition contests, and this freshman class looks to be a fun group to watch. Led by D. J. Richardson, the young guns hope to put the "Flyin'" back in front of Illini when everything is all said and done. Fellow freshmen Brandon Paul and Tyler Griffey have looked good as well, and Joseph Bertrand still is nursing an injury and hasn't seen much action thus far. The veterans, Mike Davis, Mike Tisdale and Demetri McCamey all have had flashes of brilliance in the exhibitions, and it will be nice to see how they progress as the regular season commences. This is the first year in Division I for SIUE, and the past couple of trips to Champaign they have been an exhibition game for the Illini. This time around, though, it counts in the record, and the purpose of the exhibition games are to showcase a few different looks that might come into play early in the season. The early portion of the schedule is packed with games every 3 days or so, and this pattern will go a long way in determining some sort of a rotation. Someone that does not look to be in the rotation at the moment is redshirt freshman Stan Simpson, who has not played yet this season. According to Weber, he has not "taken care of business", meaning some sort of shortcoming with classes or grades. Weber also says that "it is not fair to the other players for them to follow the rules, and then one person thinks they can cut corners and still reap the rewards of the others". The Illini women have had only one exhibition game this season, and will open up their regular season Friday evening in Philadelphia at Temple. Their home opener is slated for Sunday afternoon at 4:00 against Siena. Wednesday was Letter of Intent day, and all of the major sports had new faces to add to their respective sports. Football is not included in this, as they have their own day in the early spring. The men's basketball team welcomed 3 more quality players to the Illini family, and one has a distinct tie to the program. Crandall Head, brother of former Illini Luther Head, will join the Illini in 2010, as will center Meyers Leonard and guard Jereme Richmond. Those of you that have followed the program the last few years may remember that Richmond was the player that Weber offered when he was a freshman in high school. This hasn't typically worked well for the Illini in recent years, but on Wednesday Jereme made it official and will be an Illini in 2010 as well. This really stocks the cupboard for the next few years, and hopefully will elevate the Illini back into the national picture, much like they were in the 2004-05 season. Jolette Law also welcomed some new faces to the women's program. Alexis Burke is one of those players, and she comes to the Illini from Bainbridge, Georgia, another example of Law's commitment to recruit the country. The other player hails from within the state's borders, near Chicago. Her name is Centrese McGee from Thornton Fractional North high school in Calumet City. Law had also promised to recruit the Chicago area as well, and this is just one more example of her trying to fulfill those wishes. The future definitely looks bright for both programs, but only time will tell as to how good each can be. The Illini volleyball team continues its remarkable season, but this weekend will be one that will be truly special if they can get out of it unscathed. Friday night the Illini travel to Penn State, who is riding a 91 match winning streak. That long streak makes the Illini's 11 match streak seem very small. The Nittany Lions are ranked #1 in the nation, and for good reason. The Illini come into the match at #5 in the country. On Saturday night, the Illini visit Columbus to take on Ohio State. The Illini currently are 20-3 overall and 12-2 in the Big Ten. Finally, Illini women's soccer wrapped up their regular season on a down note, losing 1-0 to Northwestern last Friday. The Illini finished the season with a 7-9-3 overall record and 2-6-2 in the Big Ten. The Illini saw their string of six consecutive appearances in the NCAA Tournament come to an end since a team needs a .500 record or better to qualify. Better luck next year. It's funny how one win can turn the mood of some fans. Last week, everyone was pretty much calling for Ron Zook's head (some still are, by the way), but since the Illini beat Michigan, all of a sudden some people think hope has been restored and a simple win-out strategy will put the Illini at 6-6 and in contention for a bowl game. Let me assess what this means, exactly. For this to happen, the Illini will have to do the following: Beat Minnesota in Minneapolis, Northwestern and Fresno State at home, and Cincinnati on the road. Best case scenario in this 4 game season is a break even point. I don't think that the Illini can win against Minnesota, or in Cincinnati for that matter. The other two games are winnable, which should put the record at 4-8 if they're lucky. The Illini's opponent this week, Minnesota (11:00 am, Big Ten Network), can become bowl eligible with a win over the Illini, but will have to do so without one of its star receivers. Eric Decker will miss the remainder of the regular season with a foot injury, but that didn't seem to stop the Gophers last Saturday against Michigan State, as they racked up over 500 yards of offense, led by quarterback Adam Weber, who had 416 passing yards and 5 touchdowns. Added to the trip will be playing in a brand new venue, TCF Bank Stadium, which is outdoors, compared to the Metrodome. This will also be the first game on the campus of Minnesota, as the Metrodome was located downtown Minneapolis. I'm not saying that the Illini can't beat the Gophers, I just don't think it is likely. Bruce Weber's basketball team continues practice, leading up to their second and final exhibition game against Quincy University Sunday afternoon at the Assembly Hall. These exhibition games are meant to give smaller schools a chance to showcase their talents at a big name school, and also for a handsome payday for most. But, judging what happened to Syracuse the other night, losing to Lemoyne at home, the smaller schools get up for these games. Let's just not hope that Illinois becomes one of those victims. The Illini women's volleyball team continued their winning ways by defeating both Indiana and Purdue on the road, and in the process, vaulted in the latest AVCA rankings to #5. This weekend, the Illini play host to Michigan on Friday night, and Michigan State on Saturday evening. However, they suffered a huge loss off the court earlier in the week when it was determined that libero Ashley Edinger will miss the rest of the season with an ACL injury. This will be a true test of their mettle, as Ohio State and Penn State await the following weekend on the road. The Illini own a record of 18-3 overall and 10-2 in the Big Ten and are in the midst of a 9 match winning streak. The Illini women's soccer team is coming off a weekend of mixed results, winning convincingly over Michigan State 5-0, but falling to Michigan 1-0, both matches taking place at the Illini Soccer Complex. The Illini outshot the Wolverines 21-4, but could'nt find the back of the net. The Illini will close out the regular season this Friday night at Northwestern and carry a record of 7-8-3 overall and 2-5-2 in Big Ten play.